Researchers have discovered a new garbage patch — this time floating in the remote, frozen reaches of the Arctic. Plastics discarded in Europe and the East Coast of North America slowly drift to a watery graveyard north of Norway, according to a new study — endangering wildlife already struggling to adapt to a changing climate. The consequences of the pollution are not yet fully understood, but “the problem with plastic specifically being in the Arctic is that it’s going to get into the food chain of animals that are very much under threat already, that are struggling to survive in a changing climate,” study author Erik van Sebille tells the Verge. Led by Spanish biologist Andrés Cózar, the team hadn’t expected to find such large accumulations of shopping bags, fishing lines, microbeads, and other plastic fragments, given how far the polar latitudes are from pollution-creating populations. Their study reveals how far plastic can travel if not disposed of properly, “because once it enters the ocean, its destination can be unpredictable,” the scientists wrote in the study, which was published Wednesday in the journal Science Advances. “There is continuous transport of floating litter from the North Atlantic, and the Greenland and the Barents Seas act as a dead-end for this poleward conveyor belt of plastic,” Cózar said in a news release. Scientists from two global research efforts collaborated for the study, including the 2009-2014 Tara Oceans expedition team, based in France, and the 2010 Malaspina expedition team from Spain. Around the world, humans dump an estimated 19.4 billion pounds of plastic waste into the ocean each year, according to a separate 2015 study. Those bottles, jugs, threads, and scraps are visible in giant swirling “garbage patches” in the middle of the ocean, and even in trenches along the seafloor. The Mariana Trench — the deepest spot on the planet, at 36,000 feet deep — is lined with plastic bags and soda cans, videos from Japan’s marine science agency show. Plastic waste isn’t just unsightly. Birds, fish, and other wildlife can eat it and choke. Fish also gobble up fragments of deteriorated plastic, which contain harmful chemicals that spread throughout the food chain. During the 2013 circumpolar expedition, Cózar and his colleagues used nets to collect floating plastic debris. They found that most of the ice-free surface waters in the Arctic Polar Circle were only slightly polluted. But far more plastic debris had accumulated in the Greenland and Barents Sea. 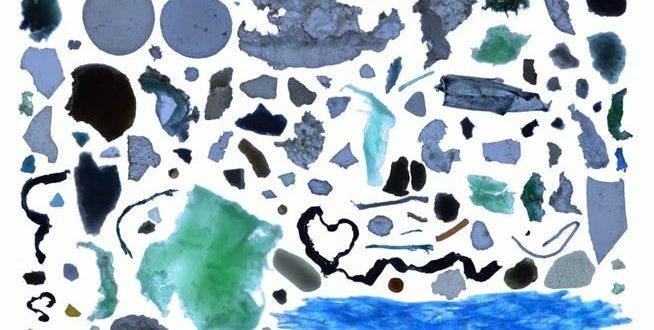 They estimated hundreds of tons of plastic fragments bobbing in the surface waters there, with even more plastic likely piling up on the seafloor below. Using 17,000 satellite buoys, the team followed a “pathway of plastic” in the North Atlantic Ocean. Data-transmitting devices confirmed the pollution is flowing toward the pole via the “thermohaline circulation,” a current that’s known as the global ocean conveyer belt. Scientists said the plastic likely originated from far away, including the coasts of northwest Europe, the United Kingdom, and the U.S. East Coast. Some plastic was also likely brought there by local shipping activity. Floating Arctic plastic accounts for only about 3 percent of the global total, according to the study. Yet more plastic is likely to pile up in the polar region as pollution from lower latitudes continuously flows upward. The scientists said they are particularly worried about how these pollution flows could affect the Arctic’s fragile ecosystems, which are already feeling the effects of global warming.